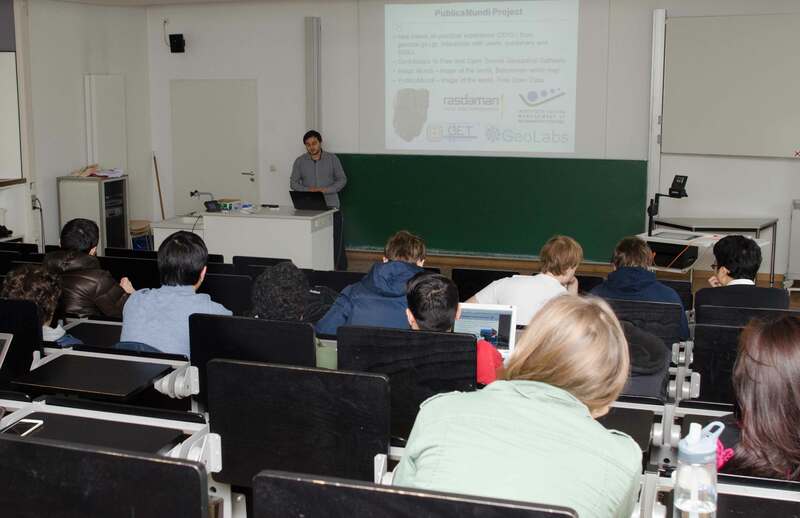 The “PublicaMundi GeoDataCamp Bremen” was held inaugurally on October 14 at Jacobs University Bremen (Germany), making researchers and data publishers familiar with the PublicaMundi platform. The event consisted of a series of presentations introducing the features of the geo-enabled CKAN based software and the connection to the OGC services, offered by rasdaman. Participants also had the chance of interacting with a live full demonstration of the PublicaMundi software, starting from publishing data under various metadata schemes (such as INSPIRE and ISO), and continuing into complex mapping visualizations and on-the fly processing of ingested data. Valuable discussions have arisen from the presentations and feedback for future improvements was collected. The majority of the audience consisted of researchers in Geo and Planetary Sciences that were able to validate the strong capabilities of the platform in terms of publishing and managing their datasets. The presentation started with a general introduction to the goals of the PublicaMundi project: publish, share and reuse open geodata. It continued with a description of the underlying software and architecture that power the platform in order to achieve these goals: CKAN, pycsw, ZOO-Project, rasdaman, geoserver etc. Next, individual features of the platforms have been presented and demonstrated, with emphasis on the Mapping and Data APIs. The final part of the presentation was dedicated to showcasing the OGC services offered through the PublicaMundi platform and their importance in interoperability and common infrastructure development. Several months passed since the first PublicaMundi GeoDataCamp where both developers and data publishers were present to get informed about the scope of the PublicaMundi project and the technologies designed in its context. The participants also tried the developed functionality (User Interface/ Web Services/ APIs) and provided comments and suggestions to the PublicaMundi developers. Utilizing this precious feedback the project’s consortium was able to improve its software and fine-tune it to the stakeholders’ needs. Now as the software components have been more mature we need your help to reassess their effectiveness, performance, completeness and ease of use. Developers: If you use open geospatial data to create mashups and mobile applications, please join us, try our services and API’s (Data and Mapping APIs) and see how our work enables you. Your remarks and suggestion will be most welcome. Data Publishers: If you are an employee of the broader public sector or even an NGO and you are somehow involved in the open spatial data publishing lifecycle, please come and try our approach and tell us how this makes your work easier. We will provide training sessions, training material, we will help you register your own organization and publish your own datasets. The number of seats will be limited so we urge you to register as soon as possible. You will receive a confirmation e-mail by 7th of September. The 2nd PublicaMundi GeoDataCamp will be organized in the premises of INNOVATHENS, the Cluster of Innovation and Entrepreneurship established by the City of Athens. For the second year in a row, PublicaMundi will proudly join FOSS4G-Europe, the meeting place of the European FOSS4G community. FOSS4G-Europe 2015 will be held at Politecnico di Milano in Como, Italy, from July 15th to 17th, 2015. A day of workshops will precede the conference on 14th July, and a code sprint will close the event on 18th JulyFOSS4G-Europe 2015 is takes place. The Conference aims to bring together FOSS4G users and developers worldwide and foster closer interactions with and amongst European communities in order to share ideas for improving geodata, software and applications openness. PublicaMundi will attend the Conference grabbing the opportunity to schedule their next plenary meeting in Como aligning with the Conference. PublicaMundi will have an active presence at the Conference, organizing two workshops (‘Deploying Web Processing Services using ZOO-Project – Examples Python WPS using PgRouting’, ‘Spatio-temporal Big Data: the Rasdaman approach in the context of the PublicaMundi project’) and one a presentation (Towards Open Big Geospatial Data for geodata.gov.gr) demonstrating the PublicaMundi technologies. Also, we have decided to have our next plenary project meeting aligned with FOSS4G-Europe! Following the success of the last year FOSS4G-Europe 2014 in Bremen, we strongly believe that the FOSS4G-Europe 2015 will be again a great opportunity to collect feedback from developers, gauge interest, explore collaborations, and showcase our work. Stay tuned, more news under FOSS4G-Europe.